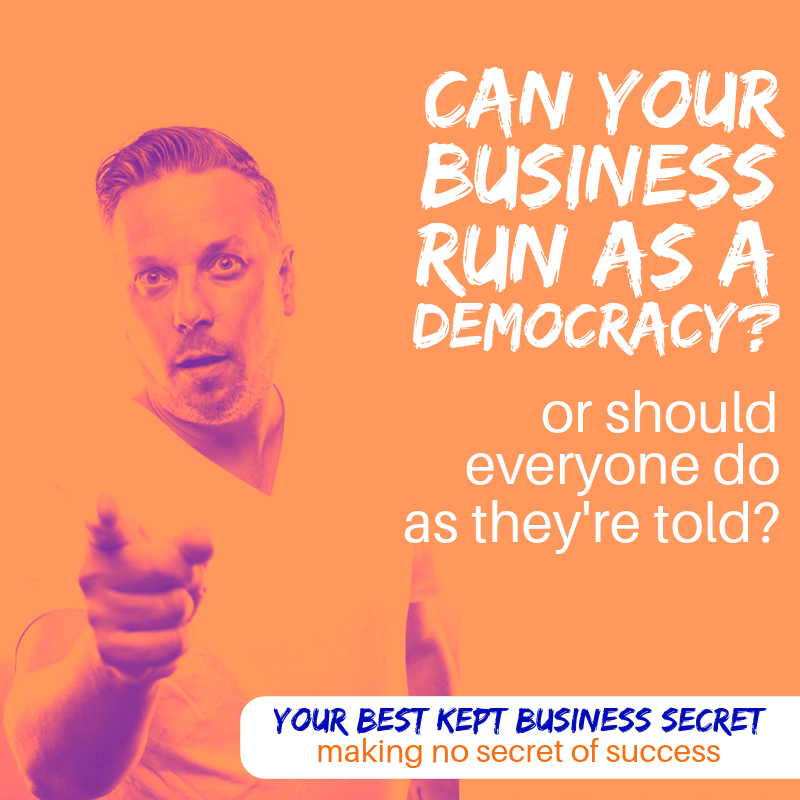 Can Your Business Be Run as a Democracy? What better way to honour the great democratic catastrophe that is Brexit, than to answer a question that nobody ever seems to come up with an adequate response to: Should executives and business owners run companies more democratically? Does that help them operate more effectively and attract better talent? Let’s take a look at how businesses are actually run. In theory, the organisation is simple, really. There is a boss. They have a boss. And so on until you get to the chief executive or president. Actually, top executives have bosses too. They work for their board of directors, who are elected by shareholders (at least, in theory – more on that later). In any case, that’s called ‘corporate governance’. Decision-making is also relatively simple in that kind of structure. Contrary to popular belief, everyone has a say. That’s right…they all do. The ‘catch’ is that bosses don’t have to listen. Everybody in the whole business can say one thing, but if the boss wants to do the opposite, they get to do that. Are you with me so far? OK, good. Since that sounds entirely autocratic and not very fair, then why shouldn’t companies be run in a more democratic way? I mean, we live in a democratic society, don’t we? We elect our leaders, choose our careers, our mates, where we live, what we do? Why should businesses be the only place where someone else tells us what to do? Well, here’s the thing. In reality, democratic governments aren’t run as democratically as you might think. Sure, we elect our leaders, but that’s done by a complex system of electorates. In that sense, your individual vote doesn’t really count, at least not in national elections. Not only that, but our leaders determine our laws and pretty much everything else that happens in the land based on an elaborate set of rules and checks and balances. In reality, “We the people” don’t have much of a say, at least not in the literal sense. And even if businesses were run like true democracies, employees wouldn’t have the right to vote, as most people envision. Employees are really nothing more than ‘hired help’. The workers. Shareholders are actually the true stakeholders in businesses and companies. And since they’re the true constituents in this analogy, they’d actually be the ones who get to vote and make decisions. (Look at the mess Debenham’s are currently in). To further complicate things, when corporate governance meets government regulation, that combination doesn’t really work very well. That’s why top executive pay in big corporations is more or less out of control. It’s also why laws and regulations by government tends to fee made in favour of the biggest companies, because they have the resources to hire the best lobbyists and lawyers to take advantage of the system. While our system of government is labeled a democracy and pure capitalism is supposed to be more or less self-regulating, in practice neither is entirely true. Ironically, well-run companies probably operate more democratically, at least in the way they serve their constituents, than our own “democratic” government does. I’ve worked with many companies, big and small, and the management teams of the best-run companies have common goals and operate in a relatively transparent way. That’s because it’s actually in everyone’s best interest to work together toward business prosperity. A healthy business with profitable, growing product lines benefits shareholders, management, employees and customers alike. That said, companies are run by human beings, which means there’s a bell curve that governs their behaviour. There are well-run companies at the top end of the curve, poorly run companies at the bottom and everything in between. But one thing’s for sure — there’s no such thing as a well-run company that doesn’t have a profitable, growing business. I’ve seen plenty of companies where employees are as empowered and engaged as you can imagine, (I worked proudly for one). But unless the management team is effective and makes reasonably smart decisions, it’s still bad news for everyone, including employees. Which is why companies have corporate culture, organisational structure and management systems. They operate more effectively that way. Still, there’s no such thing as a generic corporate structure. Every company operates a little bit differently. That’s actually the good news about living in a democratic society. Companies may not be run as pure democracies, but you can still choose what you want to do for a living and where you want to work. If you don’t like your job, your company, or the way it’s run, you can quit and try your luck somewhere else. You do have that choice. Think of it as natural selection for businesses instead of organisms. They’re analogous in many ways. When certain business cultures, structures or processes are successful, they’re replicated by other companies. It’s not a bad system, if you think about it. This is the real world and it’s a complex place. Global markets are competitive, and the qualities, capabilities and information needed to make smart decisions are not equally distributed among the people. It’s exactly the same when it comes to voting in referendum and elections. That’s why even our “democratic” government has management structure, checks and balances, and decisions made by leaders on behalf of stakeholders. Imperfect as that may be, that’s how organisations and businesses work best in the real world.